Summary: The design, construction, delivery and installation of a permanent Sea Turtle Life History exhibit to be housed at Gumbo Limbo Nature Center (GLNC) in Boca Raton Florida. The project will be an interactive educational exhibit that will allow GLNC to provide information on marine turtle biology, life history, habitat needs and everyday conservation activities for visitors to practice in their daily lives. The focus will be on the marine turtles that utilize local beaches for nesting and offshore reefs for foraging. This exhibit will enhance the visitor experience because not only will they be able to experience live animals in the tanks at GLNC, they will be informed of the important role Boca Raton plays in sea turtle life history and why it is important to understand the impacts that human activity have on the sea turtles that share the local beaches and offshore waters. Results: Wilderness Graphics, Inc. of Tallahassee, FL (WG) was chosen by the GLNC Sea Turtle Exhibit Committee to create a concept design and ultimately fabricate the exhibit. WG was chosen in part for their previous experience with creating sea turtle exhibits, their LEED certification, ability to incorporate green building practices, and their general ease with interpreting and working with the exhibit concept. During at visit to WG, staff were able to see various hand-made models up close and the resourceful materials used to create them (i.e. green vegetable ties used as sea grass), the tedious hand-etching of acrylic for the nesting trends panel, and the assembly of the diorama. On July 15, 2011, WG began installation of The Sea Turtle Exhibit in the North Room area, adjacent to the Gift Store, within Gumbo Limbo Nature Center. By July 18, 2011, all but the Nesting Beaches section were opened to the public. 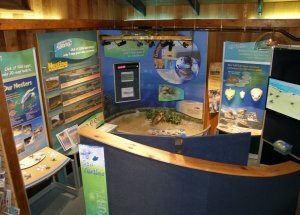 On July 28, 2011, the entire Sea Turtle Exhibit was installed and available for the visitors to explore. The exhibit is modular and designed to grow and expand with the Nature Center. Each component could be displayed on its own in other areas of the Nature Center or rearranged to accommodate expansion.